The earliest examples of portraits were of rulers: highly idealised, yet with some nod to individuality, their purpose was to exult the sitter up to the realms of the gods. In periods of Ancient Rome, more realistic portraits were commissioned, even to the point of being decidedly unflattering portrayals of the sitter. So far, Santos’ sculpture falls into neither of these categories being neither idealised nor realistic. Perhaps Santos was following the modern tradition of the artist portraying the sitter “in whatever way they please”. Take, for example, Picasso’s abstracted portraits of his lovers or Lucien Freud’s unflinchingly detailed nudes. This theory leaves it to the discretion of the reader to decide whether Santos’ work can be viewed in this vein. Santos himself seems perfectly happy with the result, commenting, “It is impossible to please the Greeks and Trojans. Neither did Jesus please everyone”. Which, conveniently, takes us back to Antiquity when artists were but humble craftsmen, indebted to their patrons and eager to please the sitter. 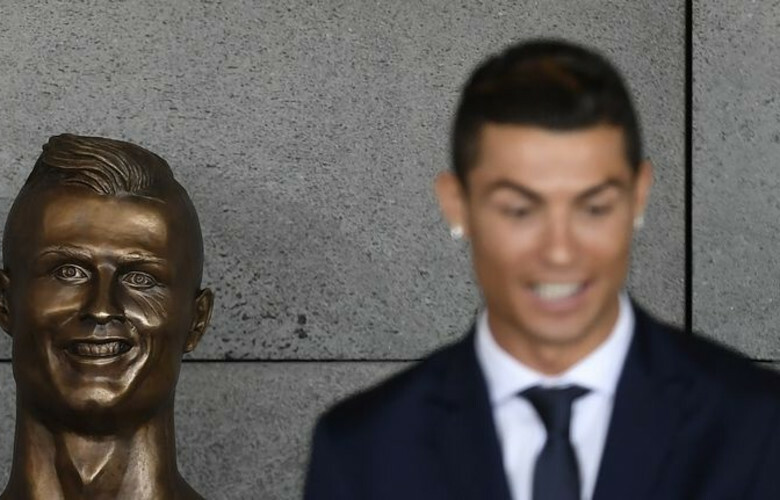 The only possible conclusion can be that Santos entirely believes he has flattered Ronaldo by, in the words of SNL’s Kate McKinnon, “capture[ing] his look right when the ball just hit him in the face”.